Do Mods and Cheats Ruin the PC Version of Skyrim? Many consider the ridiculous amount of mods and easy access to console commands the best things about playing The Elder Scrolls V: Skyrim on the PC. In today's Speak Up on Kotaku,, commenter Daemon_Gildas disagrees. Alright, PC-gamers, it's time to have one of the severe down-sides of your choice of console pointed out. So, a few months ago I rented Skyrim for the 360. I knew from buying Oblivion on the 360 that I would want Skyrim on the PC, but I didn't want to wait for a Steam Sale to at least play the game. Surprisingly, I really enjoyed it, even though Oblivion had bored me to tears. 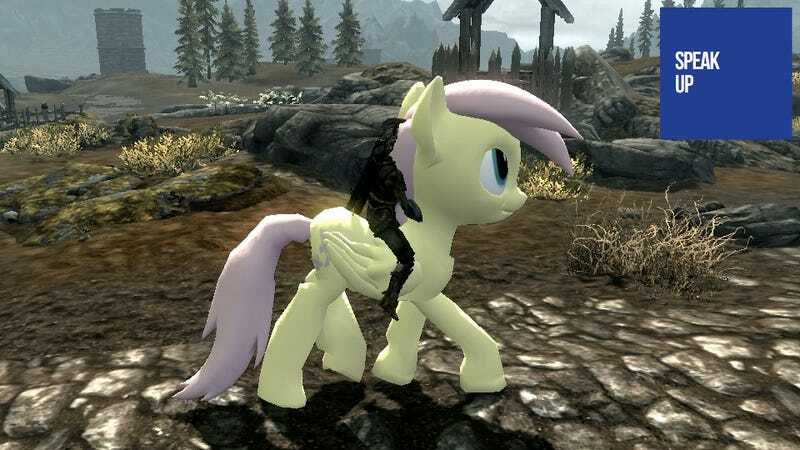 Recently, I picked up Skyrim on the PC, and the modding community is absolutely amazing at what they do. Seriously, I downloaded a mod that adds Frostmourne to the game, and I swear it's even more detailed than in the actual Blizzard cinematics! However, it also presents a very real issue; the game itself kind of gets lost in the mix. With so many possibilities — which is great, don't get me wrong — Skyrim itself feels rather bland by itself. Worse, still, is that with consoles-commands RIGHT-FREAKING-THERE, you have to make a conscious effort to not abuse them. That isn't fun. Using them isn't fun, either, but when presented with an "I-Win button", it's kind of a crappy feeling to always have it lingering in your head. As well, it's just so easy to clutter everything up to the point that it just feels like a crappy fan-game, as opposed to a breathtaking experience. Granted, Skyrim is by no means a perfect game, but between the easy access to cheats, and the seemingly-infinite add-ons, I think it just kind of ruins the actual game itself.